In this episode of the Princeton Spine & Joint Center podcast, Dr. Scott Curtis discusses Radiculopathy and Sciatica with Dr. Marco Funiciello. How does it get diagnosed? How do patients present? What are some treatment options? How do patients get better? Marco Funiciello, DO, is a board certified physician specializing in the non-operative care of spine, joint, muscle and nerve pain. 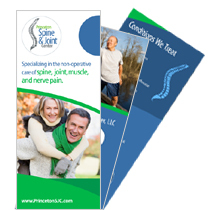 Dr. Funiciello is the Co-Director of the Interventional Spine Program at Princeton Spine and Joint Center.